At the beginning of Game of Thrones season five, the show flashes back to Cersei’s childhood trip to visit a witch in the forest. That witch prophecies the births and deaths of Cersei’s children, promising that they’ll wear crowns of gold, as well as shrouds of gold. She also correctly tells the future queen that she’ll never marry her prince, but she will marry the king. This bit of the prophecy comes true when she weds Robert Baratheon after Robert’s Rebellion. That just leaves one portion of the prophecy left to be fulfilled. The witch tells Cersei that she’ll be queen for a time, but then another will come – younger and more beautiful – to cast her down and take all that she holds dear. That begs the question, who will cast Cersei down? The most obvious answer is Daenerys. She’s a young and beautiful upstart queen with an army that can rival Cersei’s. She also sees the Iron Throne as her birthright, which makes her a likely candidate to overthrow the Lannister Queen. The only thing working against the Mother of Dragons is just how obvious of a choice she is. Ultimately, it would be more interesting to see an unexpected player cast Cersei down – and it’s important to note that the character in question doesn’t necessarily have to be a queen herself. She only has to take all that Cersei holds dear, and what she holds dear is power, Jaime, and her children. Since she’s already lost her children, that only leaves two things for this mystery woman to take from her. With those parameters in mind, there are three serious candidates left: Brienne, Arya, and Sansa. Now, Brienne isn’t known to be physically beautiful, but she possesses an innocence and inner beauty that Cersei could never hope to attain. As Reddit user itsjayrr points out, Brienne is mockingly called “Brienne the Beauty.” She also has a powerful bond with Jaime that could grow into something more, now that they’re set to fight, side by side, in the North. If the Lady of Tarth can possess Jaime’s heart, she could end up being the undoing of the queen. Narratively speaking, Sansa and Arya working in tandem would be the best payoff to this particular prophecy. The Stark sisters have suffered at Cersei’s hands. She’s partly responsible for Ned Stark’s death, she allows Joffrey to hurt Sansa, and then forces her to marry Tyrion in order to keep the elder Stark sister from leaving King’s Landing. When Sansa finally does escape, Cersei makes sure she’s hunted, leading the young woman to be used in Littlefinger’s games. As for Arya, if Cersei had never participated in Ned’s death, then she wouldn’t have had to flee the city in season one, which leads to all manner of pain for her in the future. Sansa’s grown into her own power enough to be a threat to Cersei’s, while Arya’s ability to change faces means she could kill Jaime, take his face, and then execute the queen in the guise of the Kingslayer. Either or both Starks could cast Cersei down and rob her of the things she holds dear. Or the theory could be self-fulfilling. Cersei is her own worst enemy, and she’s allowed the prophecy to eat away at her for decades. It drives her fear of Margaery Tyrell, Sansa, and Daenerys, and that fear leads her to make decisions that cost her children their lives. You could also say she’s already driven Jaime away all on her own. He leaves at the end of season seven because of her deception, and now she has no true allies, only people like Euron Greyjoy who cannot truly be trusted. 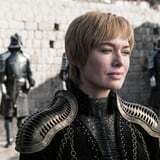 In the end, the Lannister queen may be her own undoing, because she can’t stop looking for the woman she believes is coming to claim her throne long enough to stop and realize that she’s destroying her own life.